How’s your summer going? 🤔I think I hear (and ask) that question on nearly a daily basis. Of course, the normal response is to smile and say, “Good!” But what really makes a good summer? The word that God keeps bringing to my mind is: #balance. 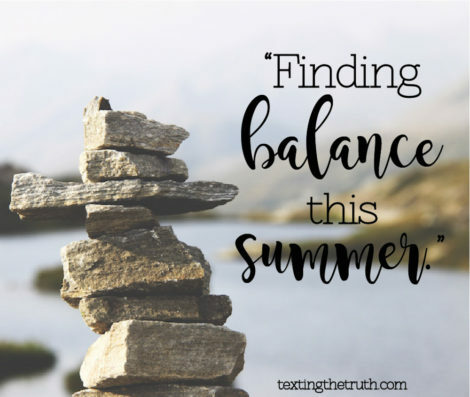 Perhaps more than any other time of year, I need balance in the summer. ☀And patience to hang on for the ride on days when life seems out of balance. I want our summer to be full of fun adventures and memories as a family. So, we go berry picking🍓, get tickets to an air show ✈, and take a vacation. ⛱ But, I’ve also learned that too many adventures leads to tired and cranky kiddos and a frustrated mama. 😬 So, to have a balanced and enjoyable summer, I need to work in time to just relax and hang out at home, too. When my eight-year-old son looked at the calendar the other day and saw nothing written down, he literally cheered and said, “Yay!! We get to stay home all day today!” 😂 It was a good reminder for me to slow down and savor the time together. So we’d love to know…from how often to let kids indulge in fun summer sweets 🍦🍧🍭and when to enforce or lighten up on the bedtime schedule 🛌😴 … what routine summertime decisions do you face? And what helps you find the right balance for your family? The children’s ministry at my church shared this great blog about responding when those dreaded words, “I’m bored!” come out of our children’s mouths this summer. During the last meeting of the moms’ group at my church this year, we made little summer activity jars. We wrote a variety of activity ideas on colored popsicle sticks and put them into mason jars. The goal is that once a week you pull one stick and find time that week to do the activity on the stick. I’ll admit, our family has missed a couple weeks already, but it’s been a fun way to work in a variety of activities into our summer and at a balanced, manageable pace. Activities ranged from making s’mores in the backyard to watching a movie at the local drive-in movie theatre. Ideas were also provided for service or volunteer type activities, such as baking cookies for a neighbor or visiting a nursing home. Googling “100 summer activities for kids” is a great starting point for ideas. Another idea is to make an ABC Summer List with activities from A-Z that you and your kids could do in the summer. It’s a great way to help them learn their ABC’s and it’s fun to come up with the list together! This time in the summer may be good to implement a new approach if things aren’t going so smoothly. Are your kids having too much screen time? Maybe make a list of things they need to do before screens. Are your kids wanting you to always entertain them? Maybe stay home for a few days and give them ideas that they could do. 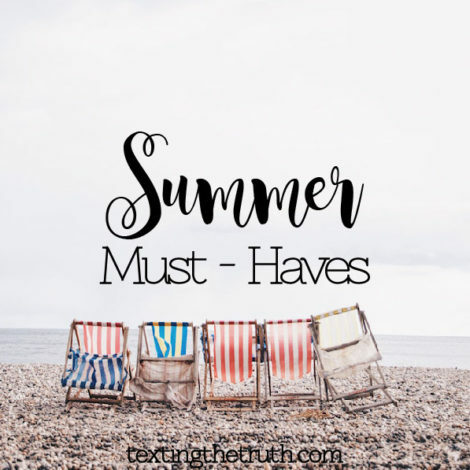 Sometimes we just need to press the restart button and summer is a perfect time to do that.